Notre Dame left wing Mario Lucia (22), the 21-year-old junior from Plymouth, Minnesota, who was the second round pick (# 60 overall) of the Minnesota Wild at the 2011 National Hockey League Draft as well as the second-leading marksman (16 goals) for the Fighting Irish last season, was kept of the scoreboard at the Mariucci Arena in Minneapolis this weekend by Minnesota netminder Adam Wilcox, the 22-year-old homegrown junior from South St. Paul who was tabbed in the sixth round (# 178 overall) of the 2011 NHL Draft by the Tampa Bay Lightning before being named the Big Ten Conference’s Best Goaltender as well as an NCAA Second Team (West) All-America selection, and the rest of the Golden Gophers. The five-time NCAA champion Minnesota Golden Gophers (7-1-0) confirmed their status as the country’s number one ranked team with a two-game sweep over the Notre Dame Fighting Irish in Minneapolis. Minnesota right wing Taylor Cammarata, the 19-year-old homegrown sophomore from Plymouth who was the third round selection (# 76 overall) of the New York Islanders at the 2013 National Hockey League Draft, had two assists in Friday’s 5-0 shutout win and set up three more goals during Sunday’s 4-2 triumph to conclude a five-point weekend. Sam Warning, the 22-year-old senior left wing from Chesterfield, Missouri, who was the second-leading scorer with 34 points (14 goals) for the Golden Gophers last season, as well as NCAA First Team (West) All-America defenseman Mike Reilly, the 21-year-old homegrown junior from Chanhassen who was the fourth round choice(# 98 overall) of the Columbus Blue Jackets at the 2011 NHL Draft, both netted a goal in each of the two games against Notre Dame. Minnesota freshman Leon Bristedt, the 19-year-old Swedish import, scored his first collegiate goal in the United States on Friday night. The struggling Ohio State Buckeyes (2-5-1) dropped a pair of home games to the Nebraska – Omaha Mavericks, who came into the weekend series at Columbus ranked # 19 in the nation by the latest USCHO.com weekly poll. Ohio State outshot their guests 26-19 on Friday night but still lost 4-1 and then built a two-goal lead late in the first period of Saturday night’s before conceding three times unanswered in a 4-3 defeat. Canadian legionnaire Tanner Fritz, the 23-year-old senior from Grande Prairie, Alberta, who leads Ohio State with nine points in eight games this fall, had a goal and an assist for the Buckeyes on Saturday. The three-time NCAA champion Michigan State Spartans (3-4-0) earned a split against the New Hampshire Wildcats on the road in New England. The Spartans were heavily outshot by New Hampshire on Friday night but Michigan State goaltender Jake Hildebrand, the 21-year-old junior from Butler, Pennsylvnia, who has been a real workhorse ever since arriving on campus, had 42 saves and Michael Ferrantino, the 21-year-old homegrown junior from Plymouth, had two goals. Ferrantino finished the weekend series with three goals while MacKenzie MacEachern, the 20-year-old homegrown sophomore from Troy who was selected in the third round (# 67 overall) of the 2013 NHL Draft by the St. Louis Blues, had a goal in each game against the Wildcats, as well. 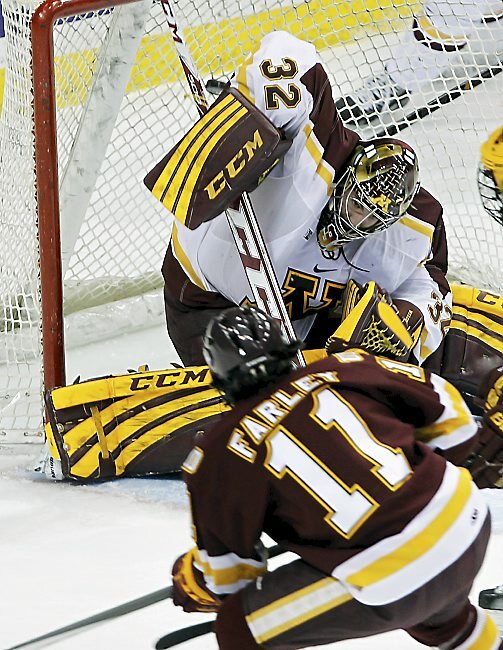 The # 1 ranked Minnesota Golden Gophers (5-1-0) earned a weekend split with the traditionally pesky intra-state rival St. 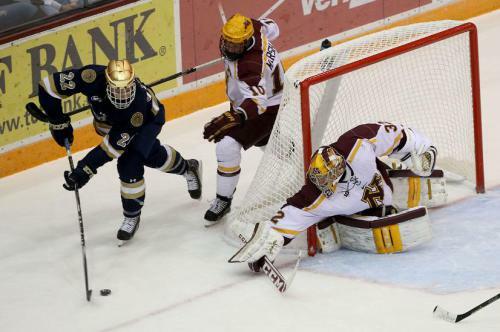 Cloud State Huskies after Justin Kloos, the 20-year-old sophomore center from Lakeville who had 16 goals and 32 points in 41 NCAA games as a rookie last term, completed his hat trick in overtime on Saturday night at the Mariucci Arena in Minneapolis. Huskies star Jonny Brodzinski, the 21-year-old homegrown junior right wing from Blaine High School who was the fifth round pick (# 148 overall) of the Los Angeles Kings at the 2013 NHL Draft and scored 43 goals in 80 NCAA games during his first two collegiate seasons, notched a goal and three points as the hosts won 4-1 in St. Cloud on Friday night. Golden Gophers right wing Hudson Fasching, the 19-year-old sophomore from Apple Valley High School who was taken in fourth round (# 118 overall) of the 2013 NHL Draft by the Los Angeles Kings and appeared with the United States at the 2014 IIHF World Junior Championships in Sweden last winter, had the lone goal for the visitors in the opening game of the home-and-home series. 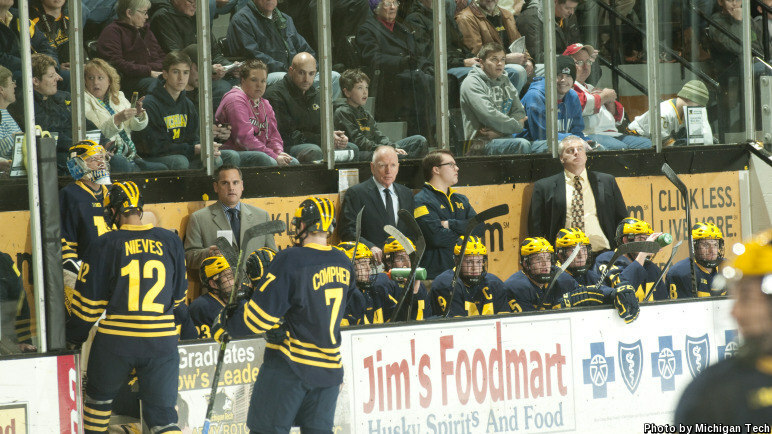 The struggling Michigan Wolverines (2-5-0), who came in ranked 15th in the country according to the weekly USCHO.com poll, suffered an embarrassing sweep at the hands of the intra-state rival Michigan Tech Huskies after being soundly beaten 4-1 and 6-2 on the road in Hougton. Captain Andrew Copp, the 20-year-old homegrown junior center from Ann Arbor who was nabbed in the fourth round (# 104 overall) of the 2013 National Hockey League Draft by the Winnipeg Jets, finally scored his first goal of this 2014/15 NCAA campaign and Dylan Larkin, the talented 18-year-old homegrown freshman center from Waterford who was the first round choice (# 14 overall) of the Detroit Red Wings at the 2014 NHL Draft and now has seven points in as many games for the Wolverines, lit the lamp for the second time in his collegiate career, as well. Neither of Michigan’s two starting goaltenders were very convincing and Steve Racine, the 23-year-old junior from Williamsville, New York, was yanked on Saturday after conceding five goals on just sixteen shots faced. The Ohio State Buckeyes (2-3-1) traveled to Buffalo, New York, and got a terrible fright from the unhearlded Canisius College Golden Griffins. The guests needed a late third period goal from David Gust, the 20-year-old sophomore right wing from Orland Park, Illinois, to salvage a 3-3 draw on Friday night after Ohio State starter Christian Frey, the 21-year-old sophomore from Arlington, Texas, who put up spectacular numbers last term (16 ga, 2.27 avg, .929 svpct) after joining the team in mid-season, was pulled after allowing two goals in the first two minutes of the Halloween contest. Fortified by much more stable goaltending from Canadian legionnaire Matt Tomkins, the 20-year-old sophomore from Sherwood Park, Alberta, whom the Chicago Black Hawks chose in the seventh round choice (# 199 overall) of the 2012 NHL Draft, the Buckeyes got a pair of strikes from Nick Oddo, the 24-year-old senior center from Omaha, Nebraska, while skating to a 4-1 triumph on Saturday night. The unlucky Michigan State Spartans (2-4-0) had to settle for a split with the visiting intra-state rival Ferris State Bulldogs after a dominant performance on Friday evening that still only yielded the hosts a loss by the minimum scoreline. Michigan State fared much better on Saturday with left wing MacKenzie MacEachern, the 20-year-old homegrown sophomore from Troy who was the third round choice (# 67 overall) of the St. Louis Blues at the 2013 NHL Draft, and sophomore Swedish import Villiam Haag each counting a goal and an assist. 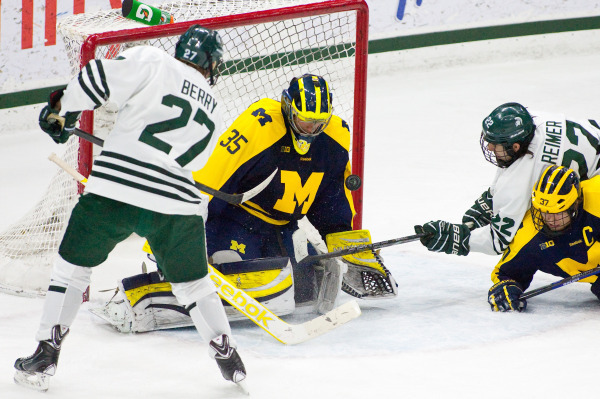 Right wing Matt Berry, the 22-year-old homegrown senior from Canton who led Michigan State in scoring two seasons ago (41 ga, 15 go, 31 pts) but suffered through an injury-plagued campaign (23 ga, 10 go, 17 pts) last term, netted his team-leading fifth goal for the Spartans this fall. Michigan Wolverines left wing Cristoval Nieves, the 20-year-old junior from Baldwinsville, New York, who was the second round selection (#59 overall) of the New York Rangers at the 2012 NHL Draft, and highly touted right wing / center J. T. Compher, the 19-year-old sophomore from Northbrook, Illinois, who was the second round choice (# 35 overall) of the Buffalo Sabres at the 2013 NHL Draft, both continue in search of their first goals, respectively, after the first seven games of this 2014/15 NCAA season. Because the first pucks of this 2014/15 NCAA season have already been dropped some time ago now and the results, particularly those involving the Big Ten Conference schools, are always extremely important, of course. Boston University center Jack Eichel (9), who skated as a 17-year-old in all five games (one goal, four assists) for the United States at the 2014 IIHF World Junior Championships in Sweden last winter, assisted on the only goal of the NCAA non-conference tilt against the Michigan State Spartans on Friday and then struck for a pivotal goal in the inter-regional clash with the Michigan Wolverines on Saturday. The top-ranked Minnesota Golden Gophers (4-0-0) rolled past the intra-state rival Bemidji State Beavers relatively easily as team captain Kyle Rau, the homegrown senior from Eden Prairie who was the third round pick(# 91 overall) of the Florida Panthers at the 2011 NHL Draft, notched a goal and an assist in each of the two games contested. Defenseman Mike Reilly, the homegrown junior from Chanhassen who was the fourth round choice (# 98 overall) of the Columbus Blue Jackets at the 2011 NHL Draft and an NCAA (West) First Team All-America selection last season, registered four assists this weekend including three in the Gophers’ 5-3 win on Saturday night. 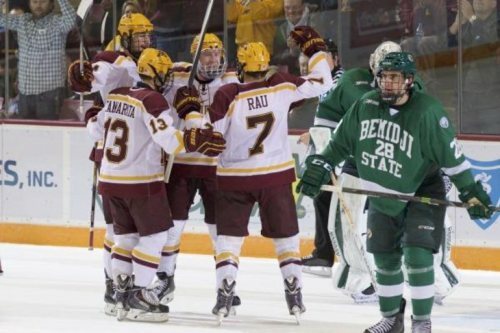 Travis Boyd, the homegrown senior from Hopkins who was the tabbed in the sixth round choice (# 177 overall) of the 2011 NHL Draft by the Washington Capitals, bagged his first three goals of this 2014/15 NCAA campaign in the two-game set against Bemidji State. The traveling Michigan Wolverines (2-3-0), ranked 14th in the country coming into the weekend according to the latest USA Today/USA Hockey Magazine poll, split a pair of games against stiff competition in Massachusetts. Power by a hat trick and five-point effort from Canadian legionnaire Zach Hyman, the 22-year-old senior right wing from Toronto, Ontario, who was the fifth round pick (# 123) of the Florida Panthers at the 2010 NHL Draft, the Wolverines finally awoke from their offensive slumber and outscored the # 8 UMass – Lowell RiverHawks 8-4. Prize recruit Dylan Larkin, the 18-year-old homegrown freshman from Waterord who was the first round choice (# 14 overall) of the Detroit Red Wings at the 2014 NHL Draft this past summer, had a four-point (one goal) game on Friday night, as well … Michigan were leading # 11 Boston University early in the third period on Saturday night before Terriers center Jack Eichel, the freshman sensation from North Chelmsford who is expected to be either the first or second player taken at the upcoming 2015 NHL Draft, netted the equalizer. The Wolverines’ 17-year-old defenseman Zach Werenski, the very highly touted homegrown freshman from Grosse Pointe who is widely considered to be a top ten pick at this summer’s NHL Draft, registered a goal and an assist against both UMass – Lowell as well as opposite Boston University. Michigan left wing Alex Kile, the 20-year-old homegrown sophomore from Troy who has seven points (three goals) in five games so far this season, also lit the lamp against both the RedHawks and the Terriers. 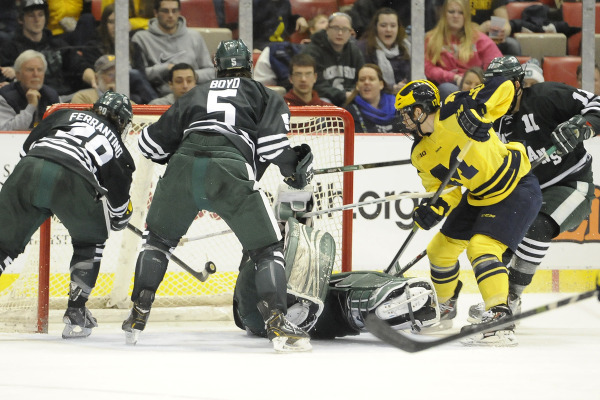 The Michigan State Spartans (1-3-0) dropped both contests on its New England road trip but still manage to display rather stingy defense in the consecutive losses to the Boston University Terriers and the UMass – Lowell RiverHawks. Spartans netminder Jake Hildebrand, the 21-year-old junior from Butler, Pennsylvania, who is entering his third season as the Michigan State starter, turned aside a combined 59 of 62 shots faced including the 39 saves made against Boston University. Defenseman R.J. Boyd, the 23-year-old junior from Lake Worth, Florida, who was the seventh round pick (# 183 overall) of the Florida Panthers at the 2010 NHL Draft, scored Michigan State’s only goal. This weekend, the Penn State Nittany Lions (3-1-2) got two goals each from Casey Bailey, the junior from Anchorage, Alaska, who holds the school record with 27 career lamp-lighters, to date, and Eric Scheid, the redshirt junior from Blaine, Minnesota, who led the Nittany Lions in goal-scoring last season after transferring from the University of Alaska – Anchorage. Semi-highly touted freshman Scott Conway, the 19-year-old native Englishman whose father, Kevin Conway, appeared for the national team of Great Britain at the annual IIHF World Championships on seven occasions during the 1990s, scored his first two collegiate goals. Ricky DeRosa, the sophomore right wing who once skated for the Philadelphia Jr. Flyers, scored a goal on Friday night and added three assists on Sunday afternoon. 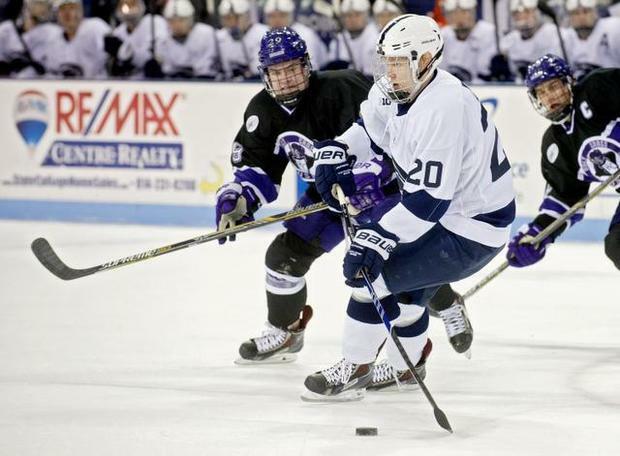 Penn State Nittany Lions defenseman Erik Autio (20), the 19-year-old freshman imported from Espoo, Finland, passes the puck ahead of the Holy Cross Crusaders during NCAA non-conference game at the Pegula Ice Arena. Penn State’s first-ever European recruit has skated in five of the Nittany Lions’ first six games this season and recorded his first collegiate point in the landslide 7-1 win over Holy Cross. Autio, who appeared for Finland and earned a bronze medal at the 2013 IIHF World U-18 Championships a couple of winters ago, is a legitimate candidate to be on the Finnish team that will defend its title at the 2015 IIHF World Junior Championships this winter. The University of Michigan Wolverines (1-2-0), who have no fewer than ten players who have already been been drafted by National Hockey League clubs on this year’s roster and were rather highly ranked in all the pre-season polls, salvaged a split with the visiting University of New Hampshire Wildcats after winning on Saturday night. The fans in Ann Arbor are still waiting for top shelf players J.T. Compher, the very highly touted sophomore right wing from Northbrook, Illinois, who led the Wolverines in scoring (35 ga, 11 go, 31 pts) as a freshman last season after becoming the second round choice (# 35 overall) of the Buffalo Sabres at the 2013 NHL Draft, and center Andrew Copp, the homegrown junior from Ann Arbor who was Michgan’s top marksman last term (33 ga, 15 go, 29 pts) after being taken in the fourth round (# 104 overall) of that same 2013 NHL Draft by the Winnipeg Jets, to shoot their first goals of this 2014/15 NCAA campaign. Nevertheless, Michigan netminder Zach Nagelvoort, the homegrown sophomore from Holland whom the Edmonton Oilers chose in the fourth round (# 111 overall) of the 2014 NHL Draft this past summer, gave his first standout performance of this new season with 31 saves and just one goal conceded against New Hampshire on Saturday night. The University of Wisconsin Badgers (0-4-0), the six-time NCAA champions who have still seven NHL Draft picks on this year’s roster despite having lost a good number of highly skilled players from last season’s squad, are still waiting to skate against opponents they can actually beat after being swept by the Northern Michigan University Wildcats in the Upper Peninsula. Not only were the Badgers blanked on Friday night, it took Wisconsin more than 58 minutes to score its only goal of the game on Saturday night, as well. Wisconsin first line center Joseph LaBate, the senior from Eagan, Minnesota, who was the fourth round choice (# 101 overall) of the Vancouver Canucks at the 2011 NHL Draft, has no points and a -3 defensive rating after four games while linemate Grant Besse, the sophomore right wing from Plymouth, Minnesota, who was the fifth round pick (# 147 overall) of the Anaheim Ducks at the 2013 NHL Draft, is also pointless and sports a -5 defensive rating after four games. The Ohio State Buckeyes (1-3-0) dropped both ends of a home-and-home series to the intra-state rival University of Miami (Ohio) RedHawks. A pair of linemates who each won gold medals with the United States squad at the 2013 IIHF World Junior Championships, center Sean Kuraly and right wing Riley Barber, each scored goals on Friday night as the RedHawks put five pucks past Ohio State netminder Matt Tomkins, the 20-year-old sophomore Canadian legionnaire from Sherwood Park, Alberta, who was chosen in the seventh round (# 199 overall) of the 2012 NHL Draft by the Chicago Black Hawks. On Saturday night, the other Buckeyes goaltender, Christian Frey, the 21-year-old sophomore from Arlington, Texas, who was very impressive last season after joining Ohio State in mid-term, was fantastic in turning aside no less than 60 shots but Miami, who came in ranked # 11 in the country according to the latest USA Today / USA Hockey Magazine poll, still managed to score twice and complete the sweep in their own barn. The Michigan State Spartans (1-1-0) shared the spoils with the visiting University of Massachusetts Minutemen despite winning the first of their season-opening two-game set at home in East Lansing. Reliable right wing Matt Berry, the 22-year-old homegrown senior from Canton who led Michigan State in scoring two seasons ago (41 ga, 15 go, 31 pts) but suffered through an injury-plagued campaign (23 ga, 10 go, 17 pts) last term, had a pair of goals and an assists in each contest with gritty UMass for a sensational six-point weekend at the Munn Ice Arena. MacKenzie MacEachern, the 20-year-old homegrown sophomore left wing from Troy who was third round selection (# 67 overall) of the St. Louis Blues at the 2013 NHL Draft, had a goal and two assists for the Spartans in their opener and finished with a four-point weekend, himself. Minnesota Golden Gophers netminder Adam Wilcox (32), the 21-year-old from South St. Paul who was named both the Big Ten’s Best Goaltender as well as Player Of They Year in addition to being named an NCAA (West) Second Team All-America selection as a sophomore last season, snatches the puck out quickly before R.P.I. Engineers sophomore right wing Jimmy Devito (20) can swat the little black disc out in midair during the final of the 2014 Ice Breaker Tournament at the Compton Family Center on the campus of the University of Notre Dame in South Bend, Indiana. The mighty University of Minnesota Golden Gophers have triumphed at the so-called Ice Breaker Tournament for the second year in succession. Minnesota, who have no fewer than 15 players who have been drafted by National Hockey League clubs on its roster, fended off traditional intra-state arch-rival University of Minnesota – Duluth Bulldogs 4-3 on Friday and then smothered the R.P.I. Engineers 3-0 on Sunday. The Golden Gophers, who were ranked # 1 in all the land by the USAToday/USA Hockey Men’s College Hockey Poll that was released on October 6th, got a goal in each game from Hudson Fasching, the 19-year-old right wing who was the fourth round selection (# 118 overall) of the Los Angeles Kings at the 2013 National Hockey League Draft and had five points (two goals) in five games for the United States at the 2014 IIHF World Junior Championships last winter, as well as a four-point weekend from Minnesota captain Kyle Rau, the 21-year-old senior center who was the third round pick (# 91 overall) of the Florida Panthers at the 2011 National Hockey League Draft. The University of Wisconsin Badgers, the six-time NCAA champion who were ranked # 12 on the latest USA Today/USA Hockey Magazine chart, managed to drop back-to-back contests at the Kendall Hockey Classic in Anchorage, Alaska. In their first game, the Badgers went with their backup goaltender Landon Peterson but ended up being beaten by the minimum scoreline at the hands of a University of Alaska – Fairbanks side that had posted the respectable record 18 wins against 15 losses and four ties last season. In the second game, Wisconsin started star Canadian legionnaire Joel Rumpel, the 23-year-old netminder from Swift Current, Saskatchewan, who was a finalist for the prestigious Hobey Baker Memorial Award last season, but the senior had a poor showing (4 goals, 21 saves) against a University of Alaska – Anchorage team that concluded the previous term with a slate of 18 wins against 16 losses and four ties. The Penn State Nittany Lions, who won their weekend series against the visiting University of Connecticut Huskies by virtue of a win, a draw and a decided 9-3 edge in total goals scored, will be the next Big Ten Conference team to make the long journey and face off against the two Alaska schools. Penn State will be appearing in the Brice Alaska Goal Rush tournament being held in Fairbanks next weekend. This occasion should come as no surprise considering the fact that Nittany Lions head coach Guy Gadowsky was in charge at the University of Alaska – Fairbanks for five years until taking the reigns at Princeton University in 2004. The Ohio State University Buckeyes gave a very good account of themselves in the weekend series against the visiting Providence College Friars, who were ranked # 4 in the country according to the latest USA Today/USA Magazine poll. Four points including two goals from Canadian legionnaire Tanner Fritz, the 23-year-old senior captain from Fort St. John, British Columbia, as well as a hat trick by diminutive left wing Anthony Greco, the 21-year-old junior from Fairbault, Minnesota, powered Ohio State to an overtime victory over Providence on Friday night. Better play on Saturday night from highly touted goaltender Jon Gillies, the 20-year-old junior from Concord, New Hampshire, who was chosen in the third round (# 75 overall) of the 2012 NHL Draft by the Calgary Flames and has twice represented the United States at the annual IIHF World Junior Championships, provided the Friars with a split, but not before a second consecutive overtime affair. The 2014 NCAA men’s ice hockey tournament hopes of The Ohio State University could quite very well rest on the skillful stick of prolific left wing RYAN DZINGEL (18), the 22-year-old junior from Wheaton, Illinois, who has assured his place in history by becoming the inaugural scoring champion of the fledgling Big Ten Conference. The Buckeyes have absolutely no chance of an at-large invitation from the NCAA selection committee but would automatically qualify for the annual NCAA men’s ice hockey tournament by winning the first-ever Big Ten Conference post-season playoff. Dzingel and Ohio State will be facing-off against Michigan State in the quarterfinal round of the Big Ten Conference tournament at the Xcel Energy Center in St. Paul, Minnesota, on Thursday. The NCAA does not recognize the results of the dreaded shootout, nor should it. 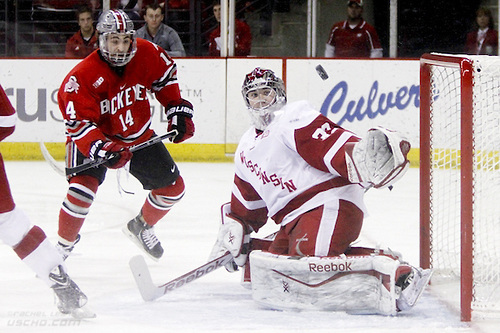 The results from the Big Ten Conference’s shootouts this season are not recognized here. It is refreshing to know that all of the Big Ten Conference’s tournament games, if necessary, will be decided in the traditional manner and not be constrained to a limited overtime session. 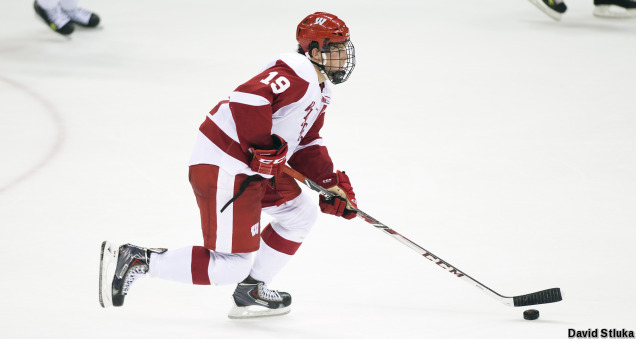 Wisconsin left wing NIC KERDILES (17) led all Big Ten Conference skaters by posting a 1.32 points-per-game average after totaling 15 goals and 33 points in only 25 appearances for the Badgers this term. The 19-year-old sophomore from Irvine, California, a second round pick (# 36 overall) of the in-state Anaheim Ducks at the 2012 National Hockey League Draft, equaled his production of a year ago (11 goals, 22 assists) despite having skated in seven fewer contests for Wisconsin this season. The explosive Kerdiles missed a couple of the Badgers’ games earlier this winter after representing the United States (5 ga, 2 go, 7 pts) at the 2014 IIHF World Junior Championships tournament that were held in Scandinavia. 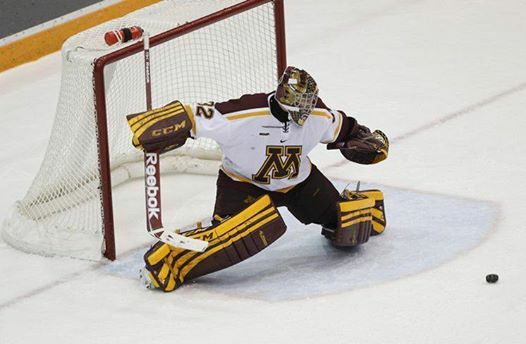 Minnesota Golden Gophers first choice ADAM WILCOX capped off his highly successful regular season campaign by being chosen as both the Big Ten Conference Player of the Year as well as the Goaltender of the Year for the NCAA’s new six-team league. The 21-year-old sophomore from South St. Paul, a sixth round (# 178 overall) selection of the Tampa Bay Lightning at the 2011 National Hockey League Draft, has now appeared in 72 of the University of Minnesota’s 76 NCAA games since first arriving on campus in Minneapolis a couple of seasons ago. Wilcox, often referred to as “Wallcox” by the Golden Gophers’ faithful, will be looking to wipe away painful memories of consecutive post-season losses to Colorado College in semifinal round of the Western Collegiate Hockey Association playoffs and Yale University at the first hurdle of the 2013 NCAA men’s ice hockey tournament. University of Minnesota center KYLE RAU (7), the 21-year-old junior from Eden Prairie who was chosen by the Florida Panthers in the third round (# 91 overall) of the 2011 National Hockey League Draft, is chased by Michigan State center LEE REIMER (22), the 23-year-old senior center imported from Landmark, Manitoba, during the Big Ten Conference clash last Saturday night at the Mariucci Arena in Minneapolis … Less than twenty-four hours after the Golden Gophers dropped points by falling in the shootout to the Spartans for the second time this season on Friday night, the # 1 ranked team in all the land rebounded to triumph by the minimum scoreline via a solitary first period goal from Rau and flawless netminding from sophomore Adam Wilcox. Key : won-lost-tied-shootout wins … overall NCAA record in parenthesis … Big Ten Conference awards three points for a victory in regulation or overtime. A shootout winner is awarded two points while the shootout loser earns one point in the league standings. Shootouts are not recognized by the NCAA. Ohio State left wing RYAN DZINGEL (18), the 21-year-old from Wheaton, Illinois, who was the seventh round selection (# 204 overall) of the Ottawa Senators at the 2011 National Hockey League Draft, widened his lead in the first official Big Ten Conference scoring race in ice hockey history by tallying three goals and six points during the Buckeyes’ two-game sweep of visiting Penn State at the Jerome Schottenstein Center’s Value City Arena. University of Michigan goaltender ZACH NAGELVOORT, homegrown freshman from Holland who has burst upon the NCAA Division I scene in dramatic fashion while clearly establishing himself as the Wolverines’ first choice between the pipes this season, has started the last six games in succession for head coach Red Berenson’s club but could be given a bit of time off soon with Penn State up next on the schedule. University of Michigan right wing LUKE MOFFATT (9), the 21-year-old senior from Paradise Valley, Arizona, who was the seventh round pick (# 197 overall) of the Phoenix Coyotes at the 2010 NHL Draft, scored a clutch third period goal to level Saturday night’s contest with the visiting University of Wisconsin and then delighted the home crowd at the venerable Yost Ice Arena in Ann Arbor by netting the only goal in the shootout to give the Wolverines the extra point …… # 12 ranked Michigan beat the # 9 ranked Badgers 3-1 in the series opener on the strength of goals from a trio of NHL prospects — freshman TYLER MOTTE, who also scored in Saturday night’s game, as well as juniors ALEX GUPTILL and ZACH HYMAN …… The weekend’s results allowed the Wolverines, who are now ranked # 10 in both the USCHO.com and USA Today/USA Hockey Magazine polls and will travel to central Pennsylvania to skate with the last-placed Nittany Lions for the very first time ever, to jump over Wisconsin in the Big Ten Conference standings after taking five of the six available points in the two-game set with the Badgers. Ohio State right wing ANTHONY GRECO (14), the 20-year-old sophomore from Fairbault, Minnesota, who has totaled a respectable twenty-one points (seven goals) in thirty-eight career NCAA games for the Buckeyes, and Wisconsin Badgers goaltender JOEL RUMPEL (33), the reliable junior Canadian imported from Swith Current, Saskatchewan, both track the airborne puck in flight during the see-saw Big Ten Conference series at the Kohl Center in Madison. The host Badgers found themselves trailing in the latter half of the second period on Fridy night but rallied for three unanswered goals to register a 5-3 victory in the series opener. The visiting Buckeyes gained a much deserved share of the spoils in the two-game after freshman backstop Christian Frey fashioned 36 saves and his new Ohio State teammates netted three times without reply in the second half of Saturday night’s tussle on the way to a 3-1 triumph. The blog is keeping a sharp eye on the third place spot in the Big Ten Conference men’s ice hockey standings this season. According to the format adopted for the first ever Big Ten Conference men’s ice hockey tournament to be held at the Xcel Energy Center in St. Paul, Minnesota, later this year, the top two teams in the regular season standings will be awarded a bye for the first round of the upcoming single-elimination playoff competition. The tournament opens on Thursday, March 20th, with the third place team meeting the Big Ten’s cellar dwellers and the fourth place squad facing-off against the fledgling league’s fifth place school. Michigan Wolverines center J.T. COMPHER (17), the exciting 18-year-old freshman from Northbrook, Illinois, who was the second round selection (# 35 overall) of the Buffalo Sabres at the 2013 National Hockey League Draft last summer and a very late cut from the United States squad that recently appeared at the 2014 IIHF World Junior Championships in Sweden, enjoyed a very productive two-game, home-and-home series against the arch-rival Michigan State Spartans. Compher opened the scoring at close range on Thursday night when the Wolverines were victorious 2-1 at the venerable Joe Louis Arena in Detroit (above). The heavy favorite to make the United States junior national team next season then added two more goals and two assists on Friday night as Michigan skated away from host Michigan State 5-2 at the Munn Ice Arena in East Lansing. Michigan goaltender ZACH NAGELVOORT (35), the 19-year-old homegrown freshman from Holland who has seemingly come from out of nowhere to supplant the more experienced Steve Racine and establish himself as the clear first choice between the pipes for head coach Red Berenson this season, stopped 62 of 65 shots faced (.954 save percentage) as the rebounding Wolverines swept the hated Spartans to regain possession of third place in the Big Ten Conference standings. Penn State left wing DAVID GOODWIN (9), the freshman from Des Peres, Missouri, who will be 22 years old by late February, scored a goal in the Nittany Lions’ lopsided 8-2 loss to # 2 ranked Boston College in the championship game of the 2nd Annual Three Rivers Classic holiday tournament and also made a nice play to draw the first assist on Taylor Holstrom’s strike during the narrow 3-2 defeat at the hands of the # 1 ranked University of Minnesota Golden Gophers recently. Earlier this past fall, Goodwin registered a pair of assists when Penn State fell 5-4 to visiting Union College, the little school in upstate New York who are now ranked # 3 in all of Division I according to the USCHO.COM poll published this week. Altogether, Penn State’s freshmen scoring leader this season has managed one goal and four points from his last ten NCAA appearances on behalf of the Nittany Lions. 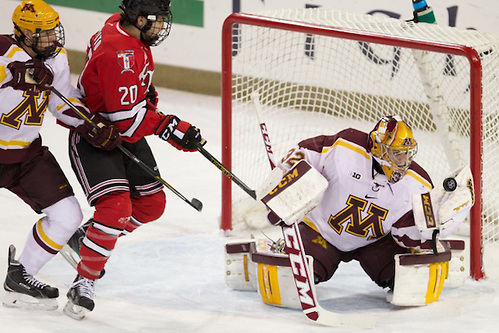 As is quite often the case, the traditional powerhouse that is the University of Minnesota Golden Gophers men’s ice hockey program continues to recruit productive college players with seemingly little trouble. No fewer than seven Minnesota skaters currently stand among the twenty Big Ten Conference freshmen who have tallied the most points so far roughly halfway through this 2013/14 NCAA season. One pleasant surprise for Minnesota head coach Don Lucia this term has been that of JUSTIN KLOOS, the 20-year-old from Lakeville whose diminutive size (5’9″ 178 lbs) probably convinced National Hockey League clubs not to draft the now flouring Golden Gophers forward. 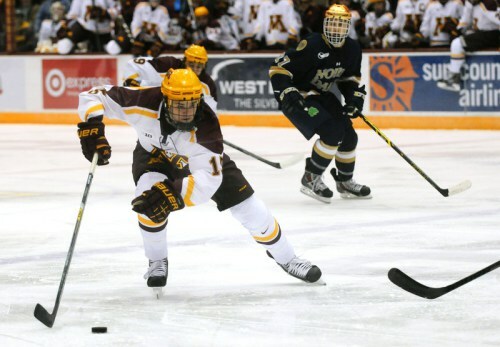 The ambitious Kloos has outscored fellow Minnesota freshmen HUDSON FASCHING as well as TAYLOR CAMMARATA, both of whom were, in fact, claimed at the annual NHL Draft last summer by the Los Angeles Kings and New York Islanders, respectively. Penn State right wing RICKY DEROSA (21) is currently tied for fourth place on the Nittany Lions’ scoring chart this season but is in the midst of a six-game pointless streak at the moment. The soon-to-be 22-year-old freshman from Aston, Pennsylvania, had a goal as well as an assist in Penn State’s 4-3 loss at Wisconsin and also drew an assist on Tommy Olczyk’s game-tying goal during the Nittany Lions’ victory over intra-state rival Robert Morris University in the semifinal round of the 2nd Annual Three Rivers Classic holiday tournament. 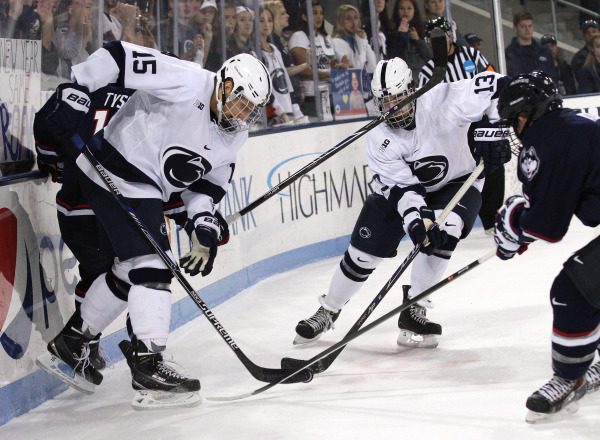 DeRosa, who played high school hockey for Cardinal O’Hara in Philadelphia, was a healthy scratch in Penn State’s first two games this season but scored on his NCAA debut against the United States Air Force Academy and has been ever present for the Nittany Lions since. Penn State right wing ZACH SAAR (17) registered an assist against host Michigan State at the Munn Ice Arena in East Lansing on Saturday night and, in doing so, snapped a five-game pointless streak. The 20-year-old freshman from Richland, Michigan, had a goal and an assist during the Nittany Lions’ close 4-3 loss to the #9 ranked University of Wisconsin Badgers at the Kohl Center in Madison after previously notching his very first NCAA goal when Penn State dropped a 5-4 decision to the # 3 ranked Union College Dutchmen. Saar has the requisite size (6’4″ 236 lbs) to win battles along the boards as well as to set annoying screens in front of opposing goaltenders. Exactly one half of all Big Ten Conference’s freshmen defenseman who have skated in at least one NCAA game this season have already been drafted by National Hockey League clubs. Among these half dozen NHL prospects, it is University of Michigan rearguard MICHAEL DOWNING who is most highly rated in the eyes of the professionals. Downing, the still 18-year-old homegrown freshman from Canton who played his scholastic hockey for Detroit’s Central Catholic High School, was the fourth round round choice (# 97 overall) of the Florida Panthers at the 2013 NHL Draft this past summer. 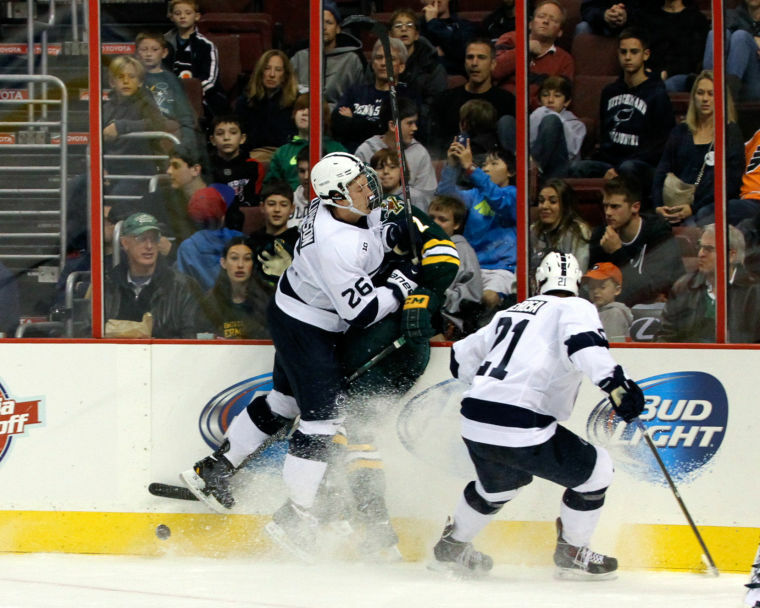 Penn State Canadian legionnaire MIKE WILLIAMSON (26), the hard-hitting freshman from Leduc, Alberta, hammers a University of Vermont player into the boards during the non-conference match-up watched by the crowd of 17,632 spectators at the Wells Fargo Center on South Broad Street in Philadelphia earlier this season. The 20-year-old defenseman was the the sixth round choice (# 175 overall) of the Vancouver Canucks at the 2013 National Hockey League Draft this past summer, but has appeared in just over half of the Nittany Lions’ NCAA games so far this season. Williamson, who has had a bit of difficulty steering clear of the penalty box during his brief time at Penn State, has missed a few games on account of injury this term but has also sat out a few others as a healthy scratch for the Nittany Lions, as well. University of Wisconsin defenseman JAKE MCCABE (19), the homegrown junior from Eau Claire who was chosen in the second round (# 44 overall) of the 2012 National Hockey League Draft by the Buffalo Sabres and went on to earn a gold medal along with the rest of the United States squad at the 2013 IIHF World Junior Championships held in Russia, has already scored a career high five goals after appearing in just twenty games for the # 9 ranked Badgers so far this season. There is also little doubt that the 20-year-old blueliner will soon set new personal standards for both assists and points, as well, before this 2013/14 NCAA campaign progresses much further. 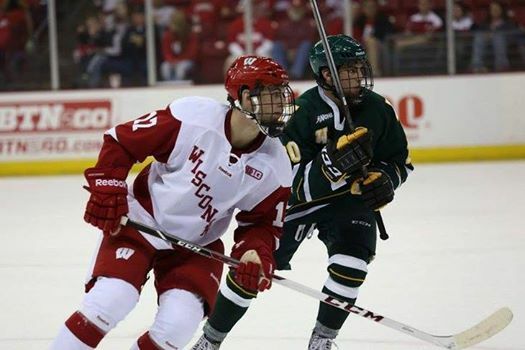 McCabe was honored as an All-WCHA Third Team selection as a sophomore for Wisconsin last spring and must be considered a serious candidate to be included on the inaugural All-Big Ten Conference First Team to be announced later this year. University of Minnesota defenseman MIKE REILLY (5), the homegrown sophomore from Chanhassen who was tabbed in the fourth round (# 98 overall) of the 2011 National Hockey League Draft by the Columbus Blue Jackets and also skated with the United States contingent that captured top spot at the 2013 IIHF World Junior Championships in Russia twelve months ago, has almost tripled his goal-scoring total from last season already with plenty of more games still to be contested on the 2013/14 NCAA schedule.